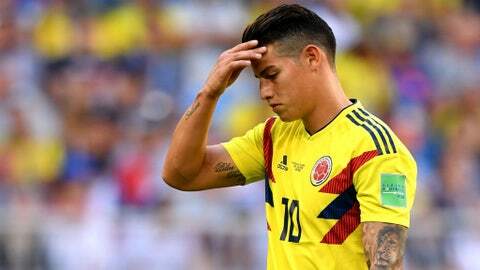 MOSCOW (AP) — James Rodriguez “doesn’t have a serious injury,” and that is good news for Colombia. The attacking midfielder, who was substituted with a calf muscle problem during last week’s 1-0 victory over Senegal, has undergone medical scans and could play Tuesday against England in the round of 16 at the World Cup. If Rodriguez can’t play, Pekerman said forward Luis Muriel will step in — as he did against Senegal. The team has previously said a swelling was found in Rodriguez’s calf muscle. Pekerman also said this year’s World Cup has shown the resurgence of center back Yerry Mina, who managed only six appearances for Barcelona last season. Mina scored twice in three games for Colombia in the group stage, including the goal which beat Senegal and secured advancement.